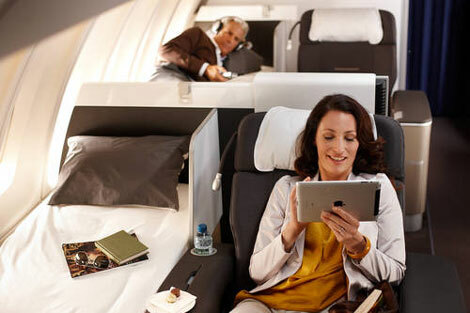 Lufthansa has retrofitted its entire Munich-based long-haul fleet with its new first class seat. The news effectively means that the German carrier will offer its top cabin class on all long-haul flights out of the Bavarian capital. This winter, a total of 24 A340-600 and A330-300 aircraft will serve 22 intercontinental destinations from Munich. According to Thomas Klühr, member of the Lufthansa German Airlines Board, Finances & Hub Munich, this will help the carrier become a leading airline in the western hemisphere. A complete retrofit of Lufthansa’s long-haul fleet (including the aircraft based in its Frankfurt hub) is currently in the process, with the first and business class cabins refit due to be completed in the summer. By the end of 2015, the carrier hopes to offer its new premium economy cabin on all long-haul aircraft. First class passengers can look forward to individual service and a wide selection of top-quality food and drinks. Each of the eight first class seats can be extended to create a fully-flat bed measuring 2.07m in length and 80cm in width. Meanwhile, business class passengers can enjoy a wide range of entertainment programmes on their personal 15-inch monitor. For premium economy, customers will experience up to 50 per cent more space over coach plus an enhanced service, where they can also check in two items of baggage.